Homalopsis buccata: Morice, 1875b: 58 [in part]. Homalopsis mereljcoxi Murphy, Voris, Murthy, Traub and Cumberbatch, 2012c: 13. Holotype: FMNH 263756. Type locality: Thailand, Ban Badan (14°31’04”N, 101°58’25” E). Distribution: Homalopsis mereljcoxi is known from lowland localities in Thailand, Cambodia, and Vietnam. On the western edge of its known range it is found as far north as Bung Cho, Uttaradit Province, Phichai District (~12°N, 104°E), Thailand and as far south as Lake Songkhla (~7°N, 100°E), Thailand. In Vietnam it is found at least as far east as Can Tho Province (~10°N, 105°E) and as far south as Vinh Thuan District Town in Kien Giang Province (~9°N, 105°E). It is present in Cambodia’s Tonle Sap, and it most likely occurs throughout the lower elevations of the Chao Phraya and Mekong drainages. It is possible, but unclear, if this species inhabits Myanmar. Gyi (1970) reports Myanmar Homalopsis with 39–43 middorsal scale rows, Homalopsis semizonata Blyth, 1855 inhabits the area on both side of the Gulf of Martaban and the Ayeyarwady delta and it has 38–43 scale rows which over-lap the range of scale rows for H. mereljcoxi. Diagnosis: Single loreal contacting upper labials 1–4; scale rows at mid-body 40–49, reduced to 30 or more posteriorly; two postoculars plus a postsubocular; and ventral counts are usually greater than 165. Homalopsis buccata has 33–40 dorsal scale rows at mid-body, reduced to less than 30 posteriorly; one postocular plus a postsubocular; ventral count less than 166. Homalopsis hardwickii has a divided loreal; H. nigroventralis has upper labials 1–3 contacting loreal; 35–39 dorsal scale rows at mid-body, reduced to less than 30 posteriorly; reverse color pattern on the venter (dark olive-gray with white spots). Homalopsis semizonata has a divided or fragmented loreal contacting upper labials 1–4 or 1–5; three prefrontals; one postocular and one postsubocular. Size and sexual dimorphism. Fifteen snakes in our sample with SVLs below 400 mm were considered sub-adults and were not included in the size comparisons. Adult male SVLs ranged from 404 to 914 mm (n=31, x̄= 654.81, SE=20.61) compared to adult female SVLs that ranged from 400 to 973 mm (n=26, x̄=626.58, SE=28.43). These differences in SVLs among males and females did not prove significant F(1,55) = 0.67, P >0.05). However, male tail lengths (n = 29, x̄ = 223.72, SE = 7.02) proved to be significantly longer F(1,52) = 20.24, P < 0.001) than female tail lengths (n = 25, x̄ = 181.24, SE = 6.09). The SDI for this species is -1.045. Homalopsis mereljcoxi displays strong sexual dimorphism in both the number of ventral scales and subcaudal scales. Males have both significantly more ventrals (males, n = 36, x̄ = 171.61, SE = 0.56; females, n = 36, x̄= 167.97, SE = 0.60; F(1,70) = 19.83, P < 0.001) and more subcaudals (males, n = 33, x̄ = 95.79, SE = 1.35; females, n = 34, x̄= 86.65, SE = 0.94; F(1,65) = 31.32, P < 0.001). Natural history. Many authors have discussed the natural history of this species (Saint Girons 1972; Brooks et al. 2007, 2010; Karns et al. 2005, 2010) under the name Homalopsis buccata. The morphology of this species agrees well with the Cambodia specimens described by Saint Girons (1972), however his data included ventral counts of 154–180, a range with some specimens below the lower end of the range observed in our sample. Cambodian specimens with ventral counts lower than 160 (unpublished data) likely belong to one or more cryptic species. In Thailand, the habitat used by Homalopsis mereljcoxi includes small reservoirs, ditches, ponds, streams, and shallow wetlands (Karns et al. 2005; 2010). Snakes were primarily obtained from fishers’ gill nets, one specimen was hand collected from a pond at night while it floated near the surface in an ambush posture. Saint Girons (1972) described similar habitats in Cambodia: streams, rivers, irrigation canals, marshes, reservoirs and the banks of lakes and rivers; he also reports it in shallow water at night and describes it resting in burrows or crevices in the bank during the day, noting that specimens move very little while on land. 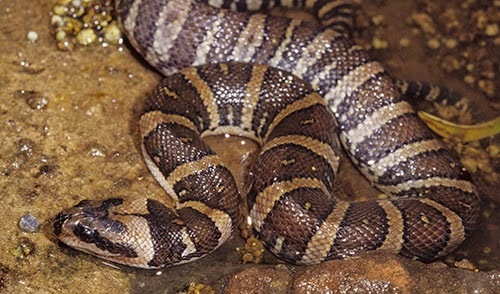 Individuals released into shallow water escaped without hesitation, but placed in a river with steep banks, the snakes immediately sought refuge along the shore. Karns et al. 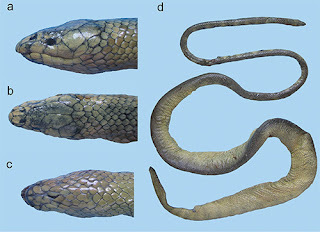 (2005, 2010) found Homalopsis mereljcoxi made up 3.59% of 668 aquatic snakes collected at seven locations in eastern Thailand; and 4.7% of 786 aquatic snakes from four locations in Thailand’s Central Plain. In a population depletion experiment at Tonle Sap, Brooks et al. (2007) found one specimen per 1718 m2. Saint Girons (1972) and Voris & Murphy (2002) reported finding only fish in the gut of Homalopsis merelj-coxi. Karns et al. (2010) found 61.5% of males, and 37.5% of females contained food. One large female H. mereljcoxi (86.5 cm SVL, 477.4 g) contained an 82.6 g Tilapia sp. (17.3% of predator’s body weight), but other prey items were relatively much smaller. One male of 8 (12.5%) H. buccata contained two fish (families Cyprinidae and Cichlidae). Brooks et al. (2009) examined more than 700 specimens from Tonle Sap, Cambodia and found fish from five families (Anabantidae 57%, Channidae 7.5%, Cyprinidae 2.5%, Mastacembilidae 3%, Osphronemidae 31%). Fish consumed are usually less than 10% of the predator’s mass (Brooks et al. 2009). Reproduction of this species in Cambodia was commented upon by Saint Girons (1972), he reported a sexual cycle with spermatogenesis in July, spermatozoa present in August with simultaneous development of the sexual segment of kidney. In February, sperm and the sexual segment were in decline. Females start vitellogenesis in November and mating occurs in December or early January, ovulation takes place in February. Saint Girons found six females with 13 to 33 large ovarian follicles or recently ovulated eggs in February. Gestation lasts until May. Karns et al. (2005) reported a 817 mm SVL, 650 g female with 17 near full term embryos (mean SVL 23.8 mm ±0,14, range = 23.2–25.0; mean mass = 11.3 g ±0.15, range = 10.0–12.3); total embryo mass without yolks was 191.5 g, a relative litter mass (RLM) of 29.0%.